WOW! What a week. Suretx was fantastic, exhausting and promising! I met several potential clients and connected with current clients. This was my first Surtex and I was unsure what to expect. The show had its ups and downs. The first day was slow--a lot of nail biting wondering if this was how the whole show was going to be. Then day two and three were non-stop. In the end, I can confidently say it went very well. My booth went up quickly except for re-covering the chairs. A HUGE thank you to my BFF Emily for sewing chair covers, listening to me freak out, and for telling me every morning that I rocked. I don't know how I would have done the show without her. And another HUGE shout out to my other BFF Josephine Kimberling! Josephine encouraged me to show at Surtex. She gave me excellent advice on what to do, not to do, be prepared for and what to expect. Only lessons learned that a veteran Surtex artist would know. Thank you, Josephine! Now for the follow-up: phone calls, meetings, proofing contracts and making some big decisions. This is a paper model I made of my booth - 8 inches tall. The real deal - 8 feet tall. It looked so empty and blah when we arrived. Two of my awesome neighbors! Melissa Ybarra from Iza Pearl and Nicole Tamarin. It was so cool to meet so many talented artists. And the best part is how supportive everyone was to each other. I made some good friends. Yes, I look like the jolly green giant standing between them. The National Stationery Show was happening at the same time. And guess whose magnets were front and center at the Ipop booth! And lets now forget the Group Four booth. I have been working with them for years and the support and encouragement they gave me before, during and after the show is appreciated more than words can say! Awesome recap Diane!!! 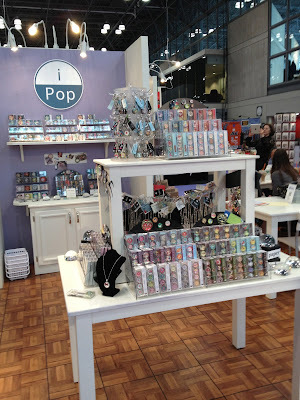 I'm SO happy that you exhibited at Surtex this year!! Your booth looked absolutely fantastic!! May you get tons and tons of contracts signed from the show!!! What a wonderful experience!!! So happy it turned out for a very talented,special lady. Good things come to a good person!!! A Big thank you to your support system, BF. Won't you be my neighbor...like in real life? :) Totally loved, loved, loved being across from your sweet self and your beautiful work...and watching you fully embrace and rock the show!! So excited for your success!! Yes Melissa I will and I hope next year I am near your booth. Your wise words and support were so appreciated! I don't know if I can wait a whole year to see you again!